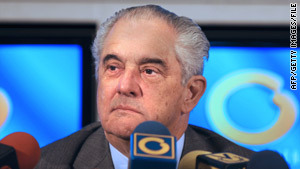 Guillermo Zuloaga has faced numerous investigations by the Venezuelan government. Caracas, Venezuela (CNN) -- The president of a Venezuelan TV station that has been critical of leftist President Hugo Chavez was arrested Thursday on charges that he abused his right to free speech, then released after a two-hour hearing before a judge. An arrest warrant was issued this week for Guillermo Zuloaga after a complaint by National Assembly Deputy Manuel Villalba, who said the Globovision owner and president had broken the law by disseminating false information that caused panic and dissent among Venezuelans. Globovision is the last remaining nationwide private TV broadcaster critical of Chavez. Zuloaga was released Thursday evening but prohibited under court order from leaving the country. In brief comments to reporters outside the justice building in Caracas, the executive -- who was detained at the airport in the city of Punto Fijo -- said that he was shocked by the days events. "In no way was I trying to flee the country," Zuloaga said. His plan had been to fly his own plane on a day trip to and from Bonaire, he said. He also denied that he said anything defamatory against President Chavez, as prosecutors claim. Venezuelan Attorney General Luisa Ortega Diaz said an investigation was started after comments Zuloaga made at a recent Inter American Press Association meeting in Aruba. "The president of the republic, Hugo Chavez Frias -- it's true that he won some elections in 1998 and has legitimacy from that," Zuloaga said at the gathering. "But after that, instead of being president of all Venezuelans, he has dedicated himself to be president of a group of Venezuelans and try to divide Venezuela for a reason, that is 21st-century socialism." Zuloaga added, "You can't talk about true freedom of expression when you have a government that uses force to repress the media ... [and] a president of the republic utilizing the force that he has and the authority that he has to manipulate public opinion and to try to impose a way of thinking." Zuloaga's family and supporters said after the arrest that freedom of expression is being trampled in Venezuela. "In Venezuela, it's a crime to offer an opinion," said Alejandro Aguirre, president of the Inter American Press Association. Zuloaga's son, Carlos Alberto, offered the same observation to CNN en Español. "Here in Venezuela, to offer an opinion is becoming a crime," he said. Villalba, the congressman who brought the complaint against Zuloaga, disputed that allegation. Venezuelans, he said in an interview with CNN en Español, have freedom of speech but cannot abuse it by making comments that cause division or hatred among citizens. An Organization of American States commission criticized Zuloaga's arrest late Thursday, saying the panel sent a letter to the Venezuelan government asking for more information. It was the second criticism of Venezuela issued Thursday by the Inter-American Commission on Human Rights. Earlier, the commission expressed its "deep concern" about human rights conditions in Venezuela. That statement focused on the arrest this week of former Zulia state governor and 1993 presidential candidate Oswaldo Alvarez Paz. The opposition politician said two weeks ago on Globovision that "Venezuela has become an operation center that facilitates narcotrafficking dealings." He also accused Venezuela of having ties to Marxist rebels in Colombia and Spain. Venezuelan prosecutors charged him with conspiracy against the government, public instigation to commit a crime and spreading false information. The Inter-American Commission on Human Rights had issued two complaints about Venezuela in the past seven months. The commission issued a 319-page report last month that said Venezuela routinely violates human rights, often intimidating or punishing citizens based on their political beliefs. The rights commission also issued a statement in August that said it "is deeply concerned about the deterioration of the situation of freedom of expression in Venezuela." On Thursday, the OAS panel said the Chavez government has used "the punitive power of the state to criminalize human rights defenders, judicialize peaceful social protests, and persecute through the criminal system persons the authorities consider political opponents in Venezuela." The commission said, "The space for public debate about Venezuelan government authorities is being increasingly reduced through the use of instruments such as the criminal justice system to silence critical or dissident expressions." OAS Secretary General Jose Miguel Insulza also joined the criticism Thursday evening, saying in a news release, "I worry about the national and international political repercussions of this situation, and that is why I request the Venezuelan authorities to promptly free Mr. Zuloaga and, should he be tried, that it be done with respect for the presumption of innocence and with all the guarantees offered to him by the law." The Venezuelan Embassy in Washington did not have an immediate comment. Spokeswoman Marielba Alvarez said officials there had not seen the commission's statement. The embassy issued a release Wednesday, however, addressing what Venezuela called "distortions and inaccuracies in the U.S. media coverage" of Alvarez Paz's arrest Monday. "This case is a legal one, not a political one," the embassy release said, adding that "Alvarez Paz's rights and guarantees are being fully respected." Although Zuloaga and Globovision face more than 40 legal and administrative complaints, the station owner said in November that he would not be deterred. "Globovision will not cease to inform the truth," he said. Prosecutors accused Globovision in June of not paying about $2.3 million (5 million bolivares fuertes) in taxes for certain advertisements the station broadcast in 2002 and 2003. That week, national guard troops and authorities from Venezuela's environmental agency staged a late-night raid on Zuloaga's Caracas home to see whether the avid hunter had killed any protected prey. It was the second raid on Zuloaga's home in two weeks. Zuloaga, who owns two Toyota dealerships, also was accused last year of overcharging on 24 cars he had sold and was storing on his property. Those vehicles were seized in a May 21 raid on the house. On Wednesday, Insulza said in an interview with CNN en Español that he is powerless to have the 34-nation organization look into human rights in Venezuela. "I am not the president of the OAS. I am not the president of the Americas," Insulza said. "I am the secretary general, who fulfills the resolutions of the Permanent Council, which consists of representatives from the 34 member nations, and nobody is going to change that. And that is the entity that should make decisions with respect to member nations." Asked whether trade and economic considerations are keeping some Latin American countries from speaking out against conditions in Venezuela, Insulza answered, "And what are we going to do about it?" Insulza, who was elected to another five-year term as OAS secretary general Wednesday, said that only former U.S. Secretary of State Condoleezza Rice asked him to investigate Venezuela. He is bound by OAS regulations to ask permission of the host nation to bring a delegation into the country; Venezuela rejected the request. Insulza said the only OAS entity allowed to address human rights issues is the Inter-American Commission on Human Rights, which has done so. CNN's Arthur Brice and journalist Carlos Guillen contributed to this report.